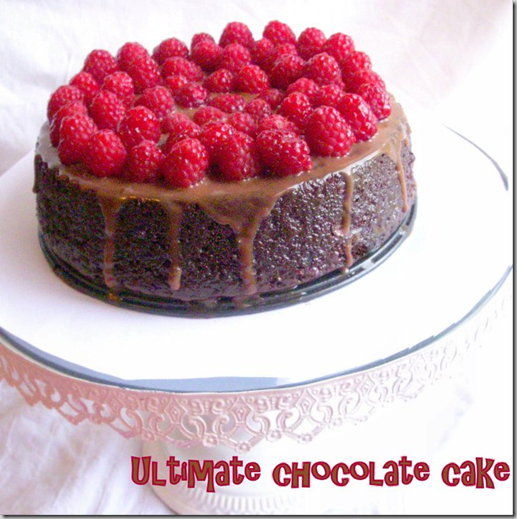 This recipe of ultimate chocolate cake is shared by Fati Naz. I can eat this cake anytime and anywhere. Take one 20 cm cake pan coated with butter lined with butter paper. In medium bowl mix cocoa and boiling water until smooth. Cover with plastic wrap or any plate and cool to room temperature. In another bowl whisk the yolks with 3 tablespoon water and vanilla until lightly combined. In a big bowl mix flour, sugar, baking powder, salt mix on the low-speed electric mixer for 30 seconds, add the butter and cocoa mixture, mix on low until all combined, raise with speed and beat on high for 2 -3 minutes and scrape sides time to time. Now add egg yolk mixture in two parts ..beating on high speed for 30 seconds after each addition ….now beat for 2-3 min on high, transfer the batter into a prepared bowl and smooth the top. Bake for 30-40 minutes or until the skewer came out clean. Chop the chocolate until very fine, heat the cream until little bubble form on sides of the pan. Add cream to chocolate mix well ..Keep aside. apply half of the ganache glaze onto the cake, leave it about 10 minutes. Run a small metal spatula around the sides of the pan and the cake, pressing firmly against the pan, and invert the cake onto a plate. Peel off and discard the parchment and poke holes all over. Apply the remaining glaze, or save some to apply on top brushing a little onto the sides of the cake as well. Cool completely for 1 or more hours, or until the chocolate is firm to touch.